Like the valuation of companies, valuing audiences in media has always been a fuzzy science at best. We frequently deal with broad assumptions, beliefs, and attention/engagement values based on personal experiences or gut feelings. Our audience valuation model is meant to be an economic model for a range of monetary values for a specific brand’s audience. If we look at this through the classic lead scoring or advertising lens, we say, “We have a target audience we want to reach called ‘buyers.’ But after the campaign, we only persuaded a few of them to ‘buy’ and a few others to perhaps show ‘interest.’ ” This is our anticipated vs. actual audience. 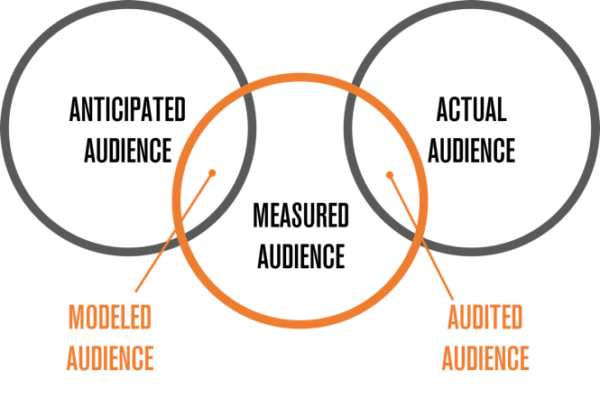 However, for a content-marketing, audience-building framework, this model is too simplistic. Audiences have the potential to have more value than simply as a lead or a buyer. We have an A-level target audience we want to reach and inspire to subscribe. These A-level audiences may be buyers. But, we also have B- and C-level subscribers too. They also have value. They may share our content, amplify our reach, and reach hard-to-get A-level target audiences. In the absolute simplest version of this, think of the existing subscriber (and previous customer) who shares our content among their network and attracts a new customer. Our existing customer might be a B subscriber, attracting our A-level audience. Put simply: Audiences are not leads. They are measured differently. Modeled audience – provides marketers the ability to make assumptions with the measured data to understand how changing the makeup of the audience, growth, or churn rates, or even the amount of data on the audience, affects the value. In turn, this can help us create the business case for strategies to increase the value of that audience – and thus create more value for the content marketing approach. Audited audience – provides the analytics and profile to understand how we are doing against the strategies we devised. After an initial audit, we can understand how we are progressing toward improving the density profile of our target audience, and increasing engagement, the level and quality of data we are assembling. It even can help us apply these values for lead scoring. With these business goals serving as WHY audiences should be measured, now we should define what it is we are going to measure. The simplest definition of audience is a group of people who gather together to view or listen to performances; or the group of people who consume or admire content – a book, art, or other media. Put even more simply: Audiences are made up of people who want to consume the content you create. If the goal of this framework is to put a financial value on the depth and dimension of each person in a brand’s audience (commonly called a “subscriber”), we must ask what defines a subscriber, and what makes that subscriber valuable? The first attribute of a subscriber vs. a general audience member is that a subscriber is addressable. In short: A subscriber is someone we can reach and know that we have reached any time we choose. For example, broadcast television audiences, podcast listeners, Twitter followers, and those who have “liked” our brand on Facebook are not addressable audiences. Now, no doubt, technological advances make addressability measurable across multiple types of platforms. However, most realistically, what marketers are valuing is their email subscription database. As it stands, email is one of the few forms of digital and social communication not completely controlled by a third-party algorithm. It provides a unique identifier, and still gives the marketer direct access to the consumer. However, regardless of the platform – because it could literally be many other things other than an email address – we will simply call this an addressable audience member (or “subscriber” for short). Targeted subscribers are more valuable. There is a multiplier to the base cost value of a subscriber who meets certain criteria for being within a targeted affinity group. Put simply: Targeted subscribers are worth more than the average acquisition cost. Then, additionally, a discount may be applied if they are far outside of the target. In other words, it is a waste of money to acquire some subscribers who have no value to our business. Subscribers who provide more data are more valuable. Having data helps realize many of the monetization methods for audiences, including and far beyond lead scoring. A multiplier is applied to the base cost of a subscriber based on how much accurate data is accumulated from that subscriber. Engaged subscribers are more valuable. Subscribers who consume more content, share it more readily, and take an action are more valuable than those who do not. There is a multiplier or discount applied based on current engagement levels. The critical key, as especially investor types have probably noticed, is that we are basing the value of a subscriber on a cost-basis vs. an asset-based approach. The cost of the subscriber is the starting value, and we then add multipliers or discounts based on attributes. And this is certainly the most conservative approach. In short, you could simply multiply your cost per acquisition by the number of subscribers (as was the case in the LinkedIn and Salesforce study) and see the cost-basis of your current audience database. I would argue, however, that simplification highly undervalues our content efforts. If we truly believe that our content helps to move audiences through an engagement journey, and make decisions in our favor, then we want to take a more asset-based approach. This is where the multipliers and discounts earn their keep. The most basic approach to this situation would be to look at this like a lead/marketing-qualified lead (MQL) scenario. A new subscriber or lead has an acquisition cost of X – the initial value of the subscriber. When that subscriber becomes an MQL – perhaps the highest level of engagement before moving into sales – that subscriber is now valued at 1.5X. Or, if the subscriber goes “dormant” and doesn’t respond, they are valued at .5X. And, of course, all these values change over time. Audience value is dynamic and changes frequently. The multipliers and discounts are self-defined and serve to value each new subscriber the marketer adds to the audience. What emerges is a snapshot of a monetary valuation of the existing audience and a means to model new scenarios to increase that value over time. Then, using the audience valuation engine tool, we can begin forecasting against audience acquisition densities, engagement, data, and overall growth and churn rates – to see a forecast of the valuation of the audience. Let’s evaluate the audience of a B2B software business. This company sells a technology solution to marketers in other companies. Over the last four years, it has built an audience of over 8,500 subscribers. Its owned media property is an online resource center of white papers and research coupled with a blog. It communicates to this audience through an email newsletter. If the company can grow the same profile of audience by a net gain of 2.5% (or 216 subscribers in any category), it increases the value of the audience by $50,000. If over the next six months the company can balance its opt-in vs. purchased subscribers to 60% opt-in vs. 40% purchased, it increases the value of the audience by $200,000. If the company loses 500 subscribers but adds a marketing automation solution that supplies behavioral information tied to the remaining subscribers’ email addresses, it still increases the value of the audience by just over $200,000. If the company rolls out marketing automation, grows A-, B- and C-level audiences by approximately 10%, and deletes the D-level audience, it ends up at 8,700 subscribers and increases the value to $2.2 million. The value per subscriber is $261. A marketing automation solution that can capture behavioral and other consumption data will improve the value of its audience. It puts a hard focus on given data vs. gathered data. It also puts a stop to purchased lists and could open a new approach to acquisition at trade shows for example. Focusing on the A- and B-level audiences can increase the depth of engagement. Putting a hard focus on retention and engagement of top-level audiences allows the company to forget about D-level audiences. In today’s world, we have pressures on us to show the results of content marketing. If we only look at our content efforts as a replacement for advertising, and measure it under that model, we will ultimately fail. A successful content marketing approach is more expensive than advertising. It just is. But because its goal is to provide multiple lines of integrated value across the business, the investment can be justified. But the investment isn’t in content. It’s in the result of the content – the subscribed audience. In short: Media companies are doing what was promised of all this newfangled web content technology and distribution. They are routing around third parties who control access to audiences and the third-party measurement platforms that create markets. They are setting new values by establishing direct relationships with proprietary audiences. They are doing what marketers have done for 100 years. Today, content only has value to the extent that it builds and keeps an audience. If you’d like to come along, let me know. We’re working this model out. It will get better and better over time. I’m hopeful that this new measurement framework can set a foundation that really helps businesses define what we’re really investing in. Want to come along for the audience valuation model ride in real life? 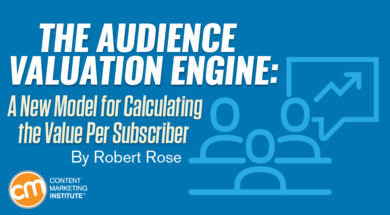 Connect with Robert – and view his presentation on it – at Content Marketing World, Sept. 5-8. Register today using the code BLOG100 to save $100.